GADSDEN, Ala. – Gary Yamamoto never had dropped a boat into Neely Henry Lake until last Monday morning, the first day of practice for the Bass Pro Shops PAA Tournament Series presented by Carrot Stix. After a more than 40 anglers failed to crack double-digit weights due to tough summer conditions, Yamamoto’s catch even surprised him. 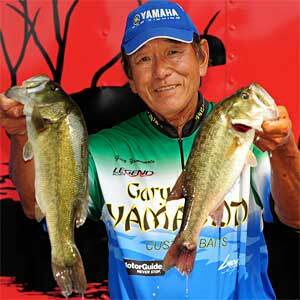 Reticent with a field of tough anglers and a tough lake, Yamamoto declined to divulge any other specifics. He caught largemouth Thursday throughout the day, and believes the pattern will hold up. Other than that … Yamamoto has lockjaw. But he’s riding a wave of confidence this season, sitting in 18th place in the PAA Tournament Series point standings with a shot at a berth in the Toyota Texas Bass Classic in October. The top 15 PAA pros, along with the Top 15 from the Bassmaster Elite Series and FLW Tour, earn automatic invitations to the world championship on Lake Conroe. That’s not Yamamoto’s concern this week, however. He finished 33rd at Lake Lanier in the March season-opener and was 20th at Table Rock in June. He’d like to put together two more solid days and lock down a win. That would be Kinami pro Steve Kennedy of Auburn, just a short two-hour drive from Neely Henry. He’s fished the lake and Coosa River all his life and Thursday whacked a limit weighing 14.20 pounds. Kennedy took his aluminum flatbottom into a narrow, winding creek that opened into a backwater area. He said he threw spinnerbaits, buzzbaits, swimbaits and plastics to cover, although sometimes that didn’t matter. “I kind of like doing one thing all day and staying with it, but not today,” Snowden said. He said swimbaits, jigs, topwaters and other baits were in his arsenal..
Gene Larew pro Tommy Biffle of Oklahoma is 24th with 8.95 pounds and Hefty pro Mike McClelland of Arkansas is two spots behind with 8.55 pounds. They’re the closest to having a shot at unseating Auten, with only eight points separating them. McClelland said he had a “lost opportunity” with a big spotted bass that came unbuttoned, a common refrain among many pros. The Coosa River’s spots are legendary for their aggressiveness.